Convert traditional fonts into fixed-width bitmap fonts. Is there a better alternative to FontDrawer? Is FontDrawer really the best app in Fonts category? Will FontDrawer work good on macOS 10.13.4? FontDrawer needs a review. Be the first to review this app and get the discussion started! FontDrawer needs a rating. Be the first to rate this app and get the discussion started! 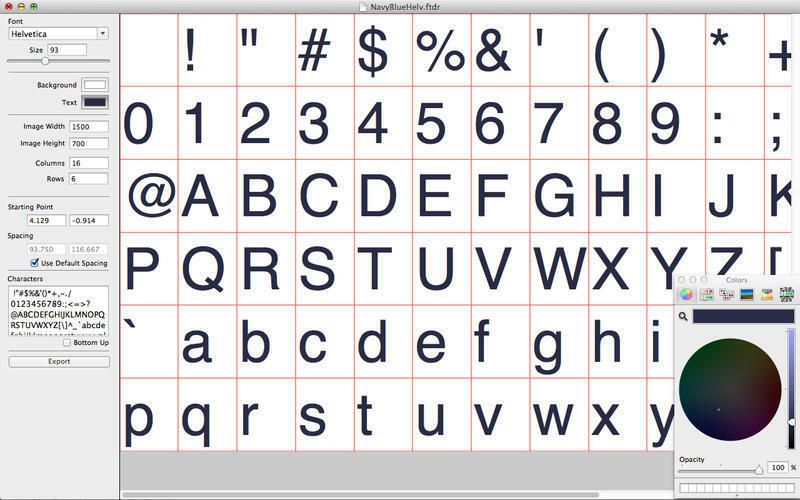 FontDrawer converts traditional fonts into bitmap fonts. Sometimes, you just need a bitmapped font. Drawing text can be an ordeal. Text drawing libraries are vast and often not-portable. Maybe you’re working at a scale where importing a text-drawing library seems overkill. If you are a game programmer, you’ll know that OpenGL does not have the built-in capability to draw text, so putting text in a game means drawing it yourself. But before you get started, you will need an image file with all the characters you care to draw in a rectangular grid. That’s what FontDrawer can make for you. Just pick a font, size, color, tweak the positioning and hit "export".